Ooh, that's great! The colour scheme is fantastic, it reminds me vaguely of a jet fighter. Excellent! The weathering really makes it. That toothbrush spatter technique is one I need to keep in mind more often. It's such a great effect. I've been playing around a lot with light greys and off-whites like this myself lately. It's fun seeing just how much variety I can get out of a seemingly very limited palette. I don't think I've ever seen any Angels Encarmine Death Company. That sounds like it could look awesome, tho. 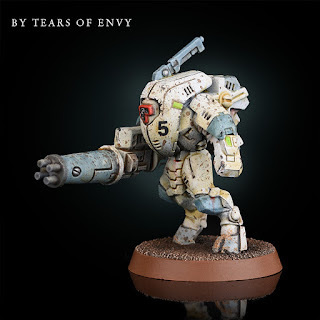 There is something inherintly cool about dirty and worn Tau battle suits. They tend to bit very borong when clean and shiny, but add some dirt to a great paintjob and boom instant magic. They can definitley survive some grit! I'm all for the camo schemes. Very nice. I like the photo set up too.. black and reflective surface to stand on. I only ever do plain white background but want to experiment a bit. It's a pain to get the lights right, but when you do it works wonders. I wasn't expecting that! Very cool. Very nice! Good job on the weathering! As I saw the headline, I expected the spanish inquisition. Of course, they didn't show up. By the way, today I was in a bookstore and saw a comic book and I thought, i know this picture from somewhere... Then I realized, it is your profile picture. Yeah, it's Jill Bioskop from the Nikopol trilogy, by Enki Bilal. Amazing series. Hey, that's a great scheme, and relatively fast to paint? Definitely fast Lasgun. Zenith sprays then selective washes. I agree about the MaK connection!